The Bialetti Venus 6-Cup stainless steel espresso maker is a high quality espresso maker designed to produce six beautiful cups at a time. 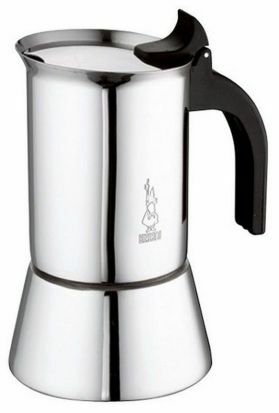 Whilst Bialetti is world-renowned for its excellent espresso makers, it is also well known for its beautiful aesthetics - the Venus espresso maker would grace any kitchen with its sleek design and stainless steel finish. Stainless steel is not just chosen for the touch of class that it adds to the Venus' look - it has less influence on the taste of your coffee than aluminium. The Bialetti Venus 6-Cup can be used on all hob types icluding induction. It should be cleaned by hand without detergent, as the taste will improve over time using this method of cleaning - so your espressos will get better and better!